Footblogball: One of the main ongoing themes in your book is looking at providing greater opportunities for the young player to develop and retain a wide visual attention. This you suggest will make the player more creative and aid to the emergence of a more skilful adult player. What in your opinion are the coaching behaviours that may narrow a young player’s visual attention? Daniel Memmert: Coaches always try to point out different circumstances, objects and possibilities in game forms to the players through instructions. Those instructions result in reducing the players’ breadth of attention. They cannot perceive all players or possibilities they have for their passes and decisions on the field. A key point is to use game forms in training sessions that “directly talk to the players”. This means that feedback is directly “coming from the game forms”, so that the coach has to give less feedback from the outside and providing instructions that reduce the player’s breadth of attention. Footblogball: Playfulness correlates with a particular way of thinking in young children. A way of thinking that encourages creativity. Yet many adult coaches are uncomfortable with the word play. They assume that it just means throw in a ball in and let them at it. Of course it can, but within the training environment “playfulness and this particular way of thinking” can provide the coach with great possibilities to set tasks that can challenge the child. I believe that this child-centred approach places greater demands on the coach especially with coaching interventions and task integration. Would you agree? Daniel Memmert: Yes, we say that it is not only throwing in a ball, and therefore we speak of deliberate play, but we have to precisely keep an eye on the constraints, the environment and the rules of the game. If you establish good rules, field measurements on how big the field is and how many players there are with how many balls, the environmental conditions result in the children being able to solve tactical problems in a better way and receiving feedback from the environment rather than from the coach in a specific way on what they can improve. This is very important. Footblogball: Cognitive effort is an important condition for skill learning (Gabbett, Jenkins &Abernathy, 2009). What is it that makes many coaches reluctant to explore and encourage the cognitive potential of young children in sport when in the long term it may lead to more positive outcomes? Daniel Memmert: Actually, cognitive factors have been underestimated so far. We are very much concerned with different cognitive factors including working memory, breadth of attention, perceptual load, anticipation, perception, and motivation. We believe that the last percentage points are especially inherent there. It is important to always challenge the players with the tasks – to cognitively challenge them. They have to always think about new things including the variation of rules and the environment within the game forms, as well as the fact that there is always variability in order to learn the development of various tactical ideas over and over again and how to transfer them into different contexts. Footblogball: For me Isolated technique training in young children is conditioning, it is linear and it decreases the width of the focus/attention leading to many young players being friendly with the ball but strangers to the game. The ability of the player to adapt their movements to the dynamics of the game through the organisation of information and action through perception and decision making is how expert performance is expressed. Comment? Daniel Memmert: An isolated technical training only results in the problem that techniques cannot be related to situations and therefore a tactic cannot be trained. We know from studies that technical training is not as effective as combined technical-perception training and cannot be applied as variable. It is important that children experience in which situations or constraints they have to use which technique. Only then they will be able to apply those techniques in real complex game forms or the real match. Footblogball: I like the idea of “1-D Games” that you introduce in your book. You use these games to promote tactical understanding, self-organisation with a focus on one basic tactical component. Within these games we integrate exploration, solving problems through trial and error and we help our players learn to adapt to changing circumstances. Could you care to elaborate on the importance of these games from the point of view of repetition without repetition and skill acquisition (understanding that skill is the technical and tactical dimensions of the game working together as complimentary pairs)? Daniel Memmert: We know that when game forms become too complex, not in a situative but in a tactical way, different if-then-rules cannot be learned appropriately. Therefore, it is necessary, that only one tactical component is the center of attention of the game form, but in a very complex and variable way through always changing environmental conditions. Only then tactical training is possible in the fastest and most variable manner. Footblogball: You also suggest 2- D Games (2 tactical components), 3-D Games (3 tactical components) as a progression as the young player develops and gets older. Would you care to elaborate on this? Daniel Memmert: When children grow older and a tactical component has been over-learned, like detecting gaps, a second tactical component can be integrated into the game form on which the children have to concentrate. The first component (e.g., detecting gaps) runs on, is automated and can be easily applied by the children, but the training takes place in the second component. Footblogball: Can your book and its contents help clubs and coaches build a more inclusive sporting structure and philosophy where performance, participation and personal development are seen to co-exist? Daniel Memmert : The basic idea of clubs and coaches has to be that they always question and search for innovative training norms and training contents. Tactical creativity has been neglected for a long time. We believe that is a very important tool for the training of adolescence and adult soccer, due to the fact that teams can always prepare better for new opponents. Therefore, it will always be related with the individual player being able to generate new ideas and apply them on the field. Creativity and innovation – those fields are involved in the future, and clubs are well-positioned if they integrate those as central components into their philosophy. 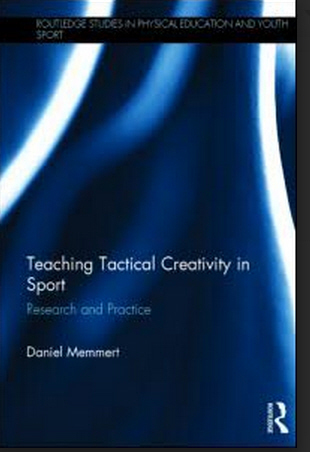 You can purchase Teaching Tactical Creativity in Sport: Research and Practice (Routledge Studies in Physical Education and Youth Sports) HERE! We would be interested in setting up coaching clinic with Dr. Daniel Memmert here in Thailand. Last year we had the pleasure to received Horst Wein. Please kindly forward us contact details to make this happen. That and other phrases like it are so tantalizing. I really wish you or Memmert had tried to share at least one example of what such a game form would look like.